← A Christmas Story House! Good morning and welcome to The Chatterbox Blog. Today I am writing a special edition to pay tribute to the attacks on the World Trade Center 10 years ago today. 10 Years ago today, it was my senior year of high school and I was sitting in 2nd period History class (of all places) and my 11th grade history teacher came in and turned on the news. By this time, one of the towers had been struck and smoke was pouring out of it. The news reporters were somewhat reporting like it was an accidental hit when we saw the 2nd plane hit live. From what I remember, everybody was quiet for about 10 to 20 minutes as we’re watching it unfold. After that, my 11th grade History teach talked a little bit about what was going on and I’ll never forget him saying “events like these are the beginning of a war”. My band practice for the evening had been cancelled due to the event and I remember leaving school that day with many parents embracing their kids (who were perfectly fine) as if to just be thankful that they were safe. The rest of the day, I remember being super-glued to the TV (as I’m sure most families were). 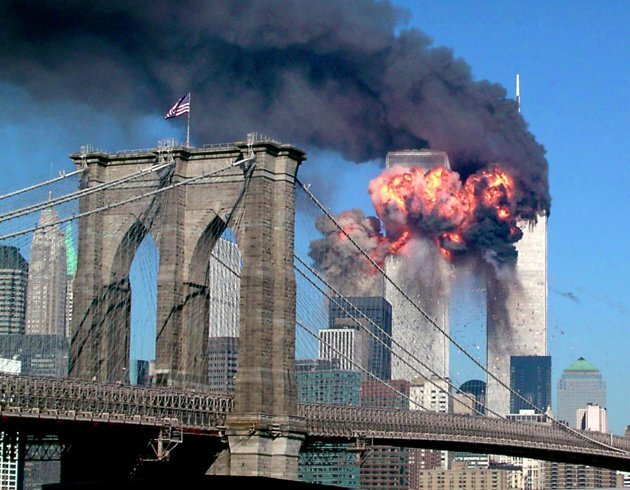 There were definately alot of images from 09/11/01 that I will never forget! Reflecting on this event, I would really enjoy seeing America get back to the way it was on September 12th, 2001. Everybody seemed to be living in a common “America” rather than a narrow minded political party. People seemed a little more human towards each other and supported the idea of “Ask not what your Country can do for you. Ask what you can do for your Country” whether it be serving in the Military, helping people in need, or donating. In closing, I’d like to challenge everybody to write something about their experiences from 9/11/01. For one, its great to get your feelings out there and it’s also a good way to get creative again. Start your own blog! WordPress hosts them for free and you can use it as your own sounding board for ideas and thoughts that you have. If you are writing a topic on 9/11, then please share in my comments and I promis that I will subscribe anf comment on every one of them. If there is one thing to take away from my post today is to take a little time and enjoy your life, enjoy your family, and enjoy your freedom. There are many young men and women serving our country in a place thousands of miles away from their families so that we can enjoy these things. Posted on September 11, 2011, in Uncategorized. Bookmark the permalink. 2 Comments. i remember being off work that day and when i woke up the first tower had already been hit. i remember watching the news when the second one hit. It was a “what the f**k” kinda moment. It seemed unreal. as i watched the news later it was reported a third plane hit the pentagon. it was a weird, kinda freaky feeling. Then i remember going outside and seeing what seemed like lots of planes flying over our house (i guess they were emergency landing at Lahm Airport) as it was reported that no aircraft was alowed in the sky. A very sad day…all those innocent people killed. Thanks for the comment, Big Brother! Yeah, it’s really hard to forget. I also remember Mom n Dad wanting me to go fill up the gas tank before price jumped to $2.00 a gallon! Lol and then I waited in line for 45 minutes to get it!